Mexican Revolutions. PowerPoint. Mexican Revolution. Skit. Latin American Revolutions. Hands On Learning. Hands-on learning. Role Plays. Role-play. Role-plays. Class skit. Mexican Independence. Role-Play. Miguel Hidalgo. Miguel Hidalgo y Castilla. Creole. Creoles. Mestizos. Cry of Dolores. Jose Maria Morelos. Agustin de Iturbide. Emperor Augustin I. Santa Anna. The Alamo. Texas Independence. Mexican-American War. Benito Juarez. Porfirio Diaz. Pancho Villa. Emiliano Zapata. Literary and Social Club of Queretaro. 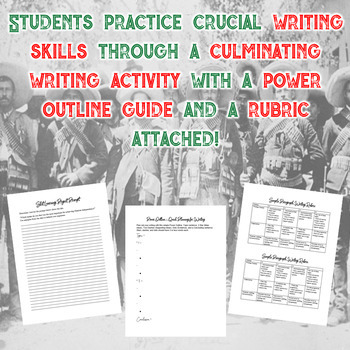 This is a full lesson plan on the Mexican Revolutions between 1810 and 1920. I have created a way to make direct instruction more engaging, fun, and hands-on for the students! Students explore content before learning it directly. Students then create skits in small groups that they perform for the class after they teach each slide of direct instruction. This allows students to perform, and move around during notes, and some student creations are HILARIOUS! My students LOVE creating and performing skits, and it is a great way to become comfortable in front of class while learning engaging content. Also, this product works on student writing skills with a concluding writing prompt and a rubric is included! The process of organizing their writing with a simple Power Outline format has led to highly increased writing and social studies test scores in my school! Looking for Latin American Independence? Teach it with this skit activity! 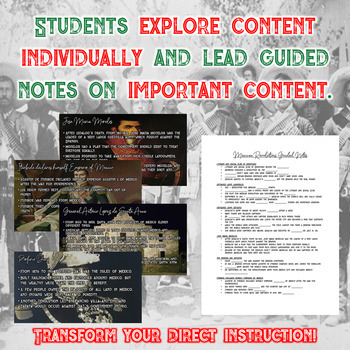 1) Highly-Visual notes with fill-in-the-blank Student Guide for taking notes. The Mexican Revolution, Mexican Independence, Miguel Hidalgo y Castilla, Creoles, Mestizos, Cry of Dolores, Jose Maria Morelos, Agustin de Iturbide, Emperor Augustin I, Santa Anna, The Alamo, Texas Independence, Mexican-American War, Benito Juarez, Porfirio Diaz, Pancho Villa, Emiliano Zapata, and the Literary and Social Club of Queretaro. 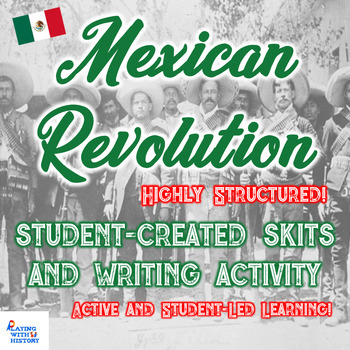 Students LOVE this as it gets them actively learning about the Mexican Revolutions and get to be CREATIVE! I hope that you and your students love this product!